Since its closure in 1978 the school’s condition had deteriorated. 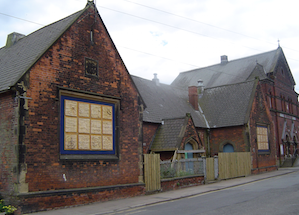 The situation had become especially serious in recent years, and the building had been identified as ’at risk’ by English Heritage and North Lincolnshire Council’s Conservation Section. The restoration project, which followed previous unsuccessful attempts by various bodies to find a solution, combined heritage uses with community and business facilities in order to create a sustainable future for the historic building and playground. An educational heritage centre celebrating the Wilderspin legacy including re-creations of schoolrooms and living history interpretations for the enjoyment and education of the local community and visitors from further afield. Community facility including flexible spaces for rent or hire, educational activities and informal family learning. Visitor amenities including car parking, Wilderspin garden playground, shop and refreshments room. The original Wilderspin playground, with its rotary swing, trees and flowers, has been reconstructed, whilst the restored school building houses reconstructions of the Wilderspin Infant Schoolroom and a Victorian Classroom, and support facilities including displays of educational history, along with multi-purpose community facilities and visitor services. As well as providing an exciting and informative experience for visitors and tourists, the school is a centre for developing educational programmes and outreach for schools from the region and beyond. In heritage terms the school ranks as one of the prime educational heritage sites in the UK, and is linked with other leading sites in the UK and Europe. We are developing partnerships within the UK and abroad – especially with partners in Europe – drawing on educational heritage to inform current debates about schools and parenting, and to promote exchange of ideas, skills and practice in the care and development of the young. “To restore the former Queen Street School and find uses to ensure its long term viability as a celebration of the life and work of Samuel Wilderspin, for the benefit of the people of Barton upon Humber and elsewhere”. In 1998 the Trust joined forces with other partners – Barton Civic Society, Barton Town Council, Barton Regeneration Partnership and North Lincolnshire Council – to make the Mission Statement a reality.